Dr. Lopez has more than 15 years of experience in federal and local government, academia, non-profit and media relations. 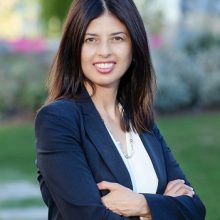 She is currently the Chief of the Office of Immigrant Affairs for Los Angeles Mayor Eric Garcetti and also advises the Mayor on immigration and refugee policy for his administration. Dr. Lopez was formerly an Associate Dean of Strategic Initiatives and Diversity for the University of Southern California and also a professor of political science at Chapman University and a senior level executive the National Science Foundation where she served as a Program Officer investing in research and development for the US government and university systems. Her government experience spans working with the federal government agencies, state legislatures, and local government. Under the Obama Administration, she worked with the White House Office of Domestic Policy and Public Engagement on their blueprint for New Americans and Building Welcoming Communities and also with the United States Citizenship and Immigration Services on citizenship initiatives. Dr. Lopez also has worked with the Department of Homeland Security on issues ranging from refugee policy, immigration, and law enforcement and security. She is also responsible for coordinating local efforts on policy implementation and development of public-private partnerships. In 2017, she led and coordinated the establishment of the LA Justice Fund, a $10 million dollar legal defense fund for immigrants and vulnerable populations established by Mayor Garcetti, the county board of supervisors, and philanthropy. In addition, she implemented a city-wide enrollment program for Health4all program to provide health access for immigrant youth. She regularly serves as the primary spokesperson for Mayor Garcetti on issues impacting immigrants and other vulnerable communities. Her expertise also includes refugee policy and developing innovative programs for refugee integration. She regularly speaks at domestic and international venues on refugee integration issues and migration flows. In addition, Dr. Lopez has regularly contributed to the following media and print networks: Atlantic Live, Los Angeles Times, NPR, KPCC, including Telemundo, Univision, NBC Latino and CNN en Español. She has been awarded a German Marshall Fund Transatlantic Inclusion Fellow, a Center for Strategic and International Studies Abshire-Inamori Fellow, America’s Leaders of Change Fellow, and member of the Pacific Council on International Policy. She received her PhD and Master degrees at USC in Political Science and Public Policy. In her spare time, she advocates for special needs children and serves on the board of Villa Esperanza, a non-profit focused on education for children and adults with disabilities.